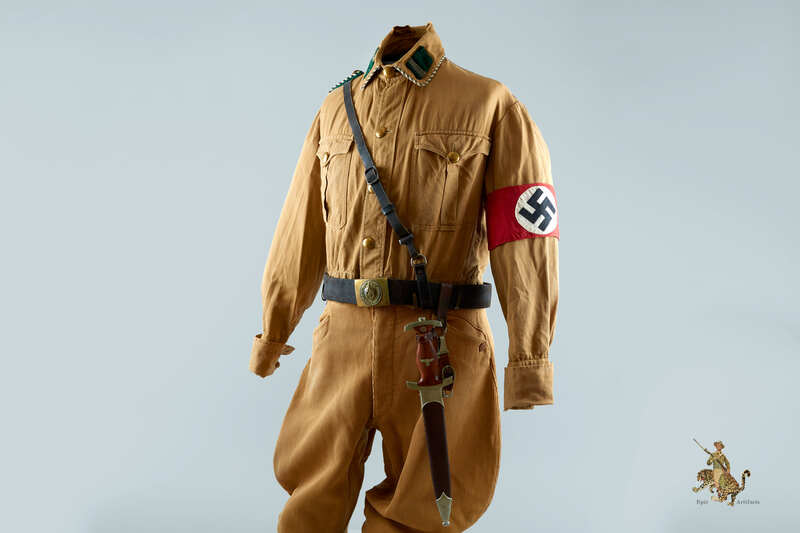 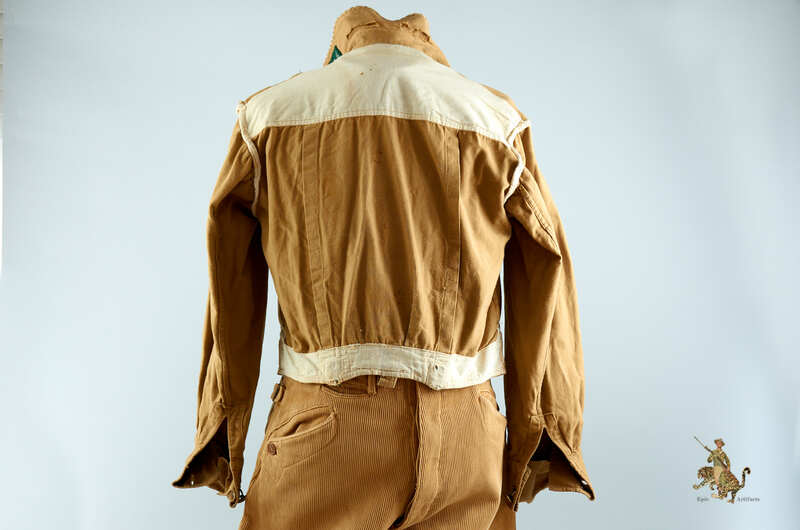 Product Description: This is an all-original SA tunic with trousers, for an SA-Rottenführer in Sturm 8 of Standarte 75, Gruppe Nordmark. 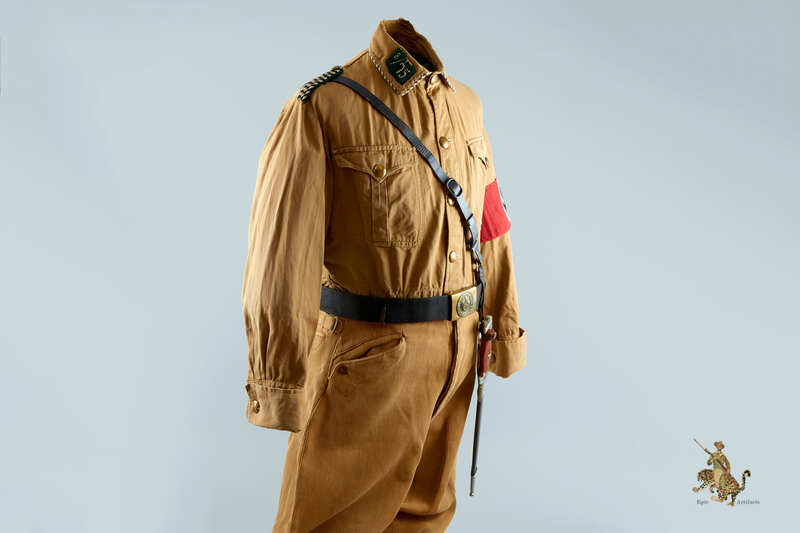 This sale is for the tunic and trousers only, the armband, belt with cross strap, and dagger are not included and are shown in the first three photos only to show how this uniform will look when fully equipped. 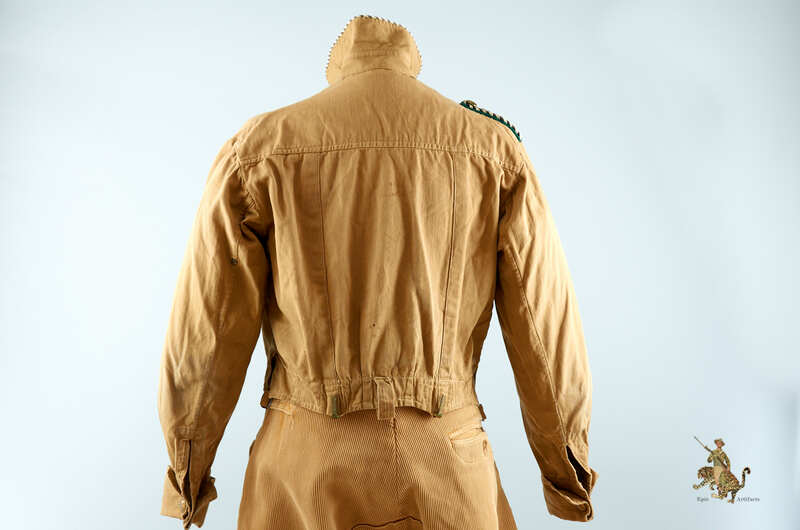 We do have all of these items available if needed to complete a full display of an SA-Mann. 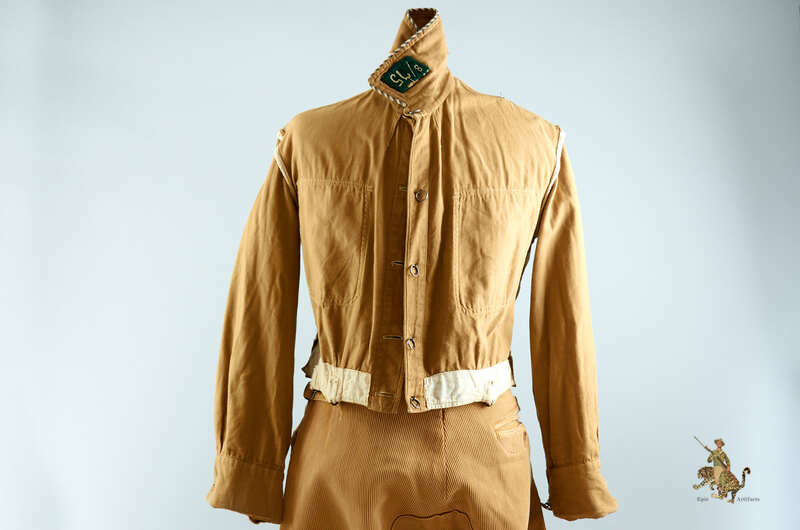 The tunic is an early one, made of tan cotton, that shows considerable honest wear and use, but remains in very good condition. 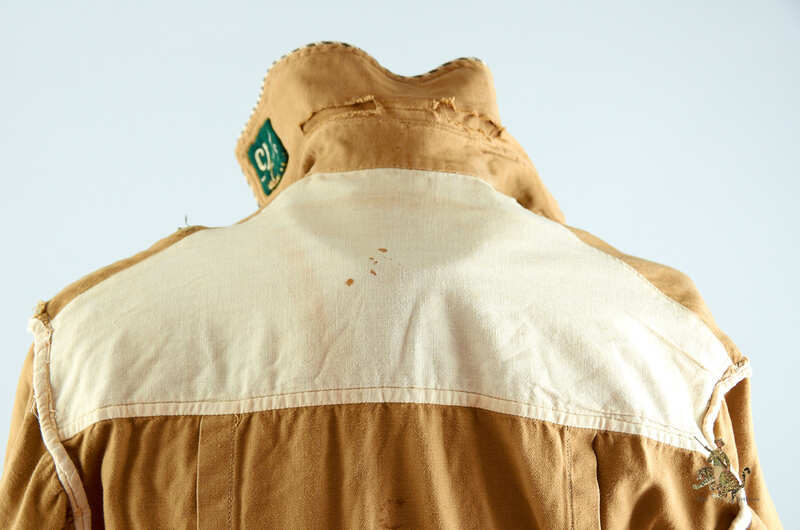 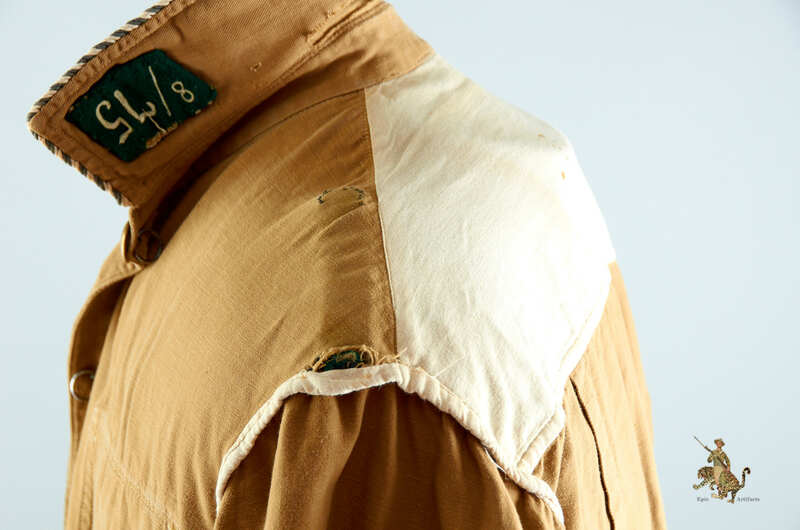 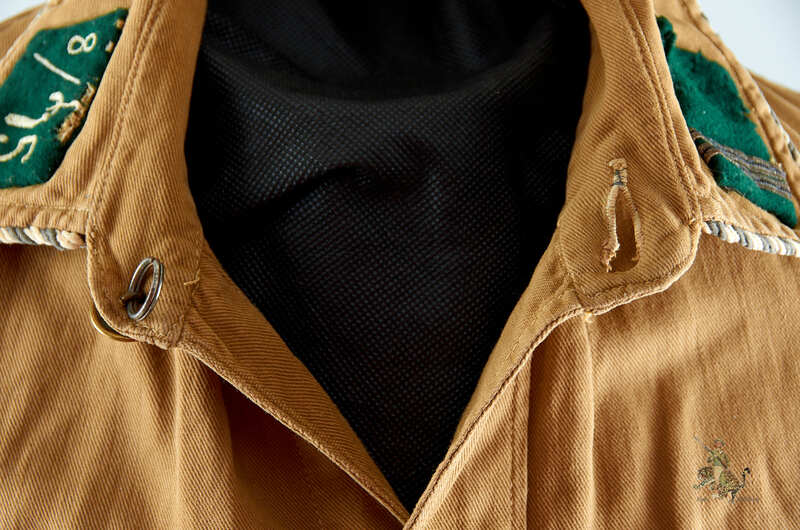 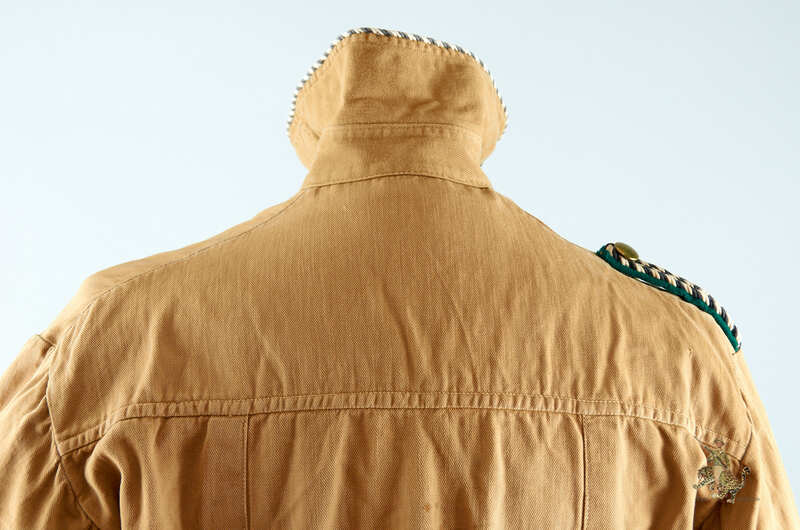 There are some wear holes to the collar and cuff edges. 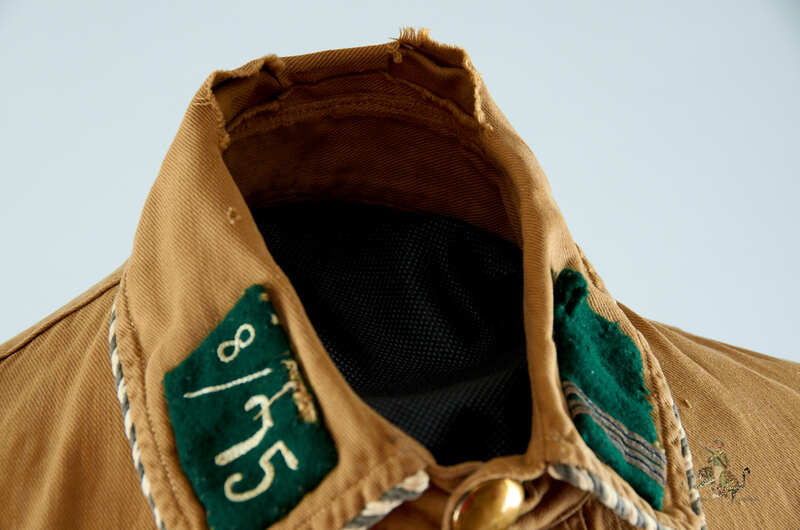 The collar is complete with its original insignia, including black and white twist piping, and emerald green wool collar tabs with white chain stitch embroidery and white rank Litzen with a black center stripe. 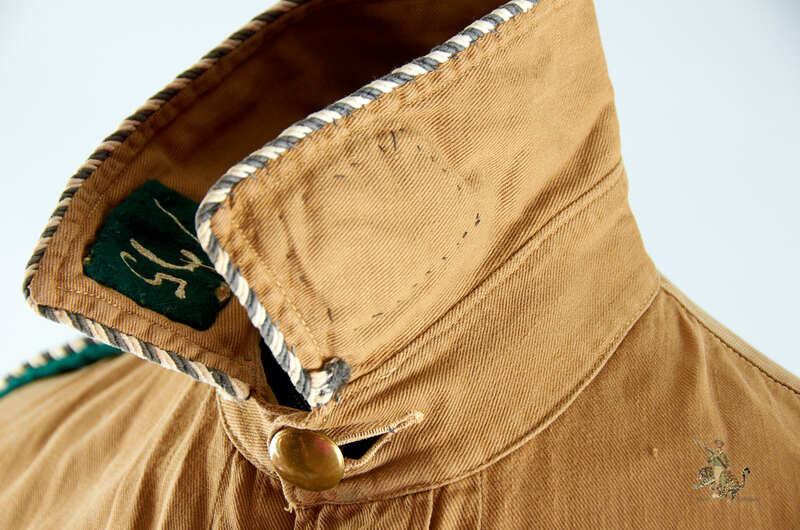 The collar tabs show wear and what may be some minor moth munches. 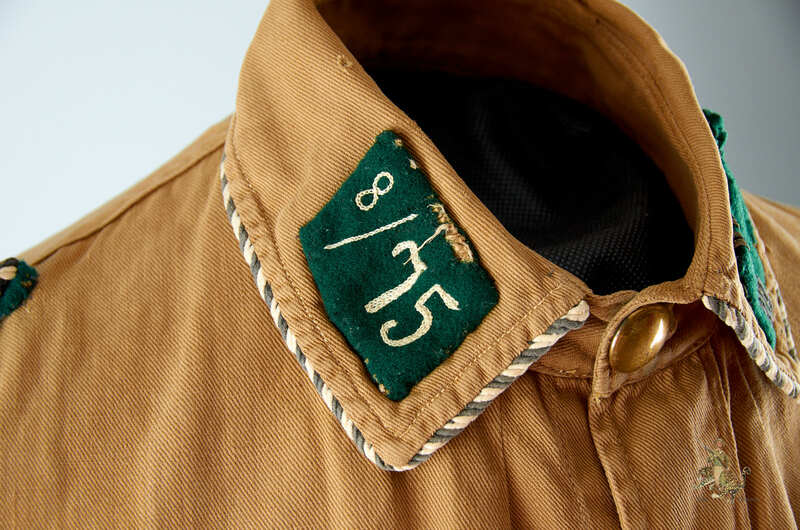 This SA tunic is complete with one original shoulder board, as is proper, showing wear matching the tunic. 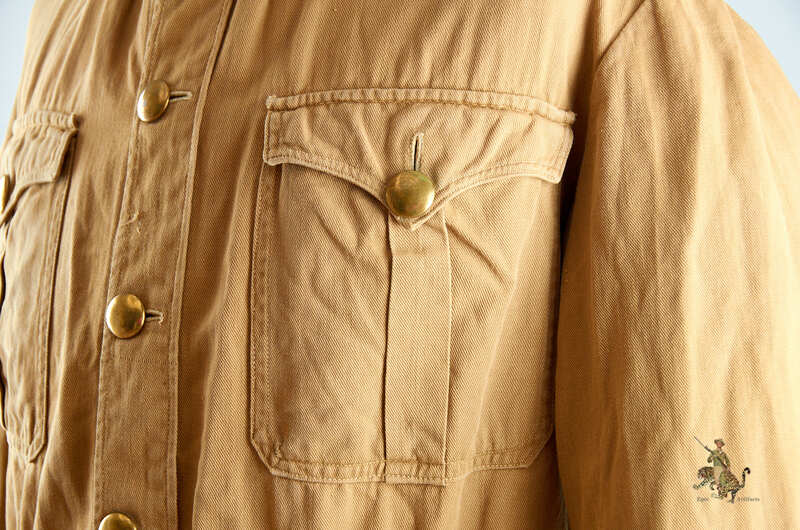 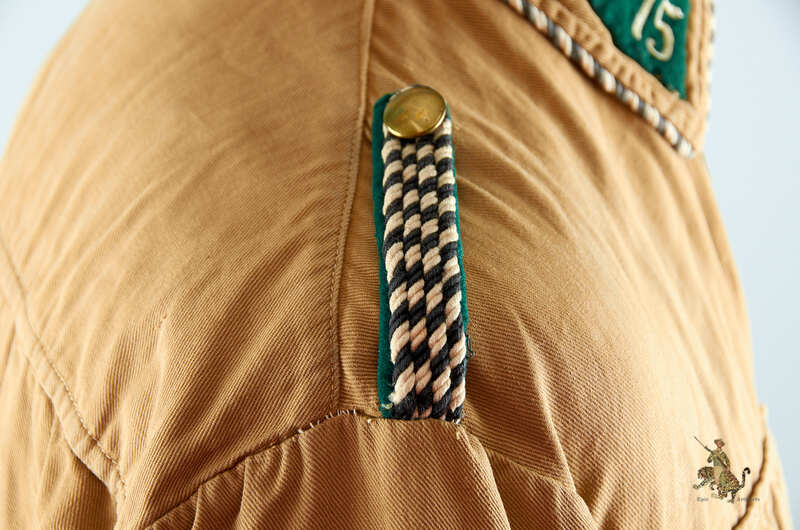 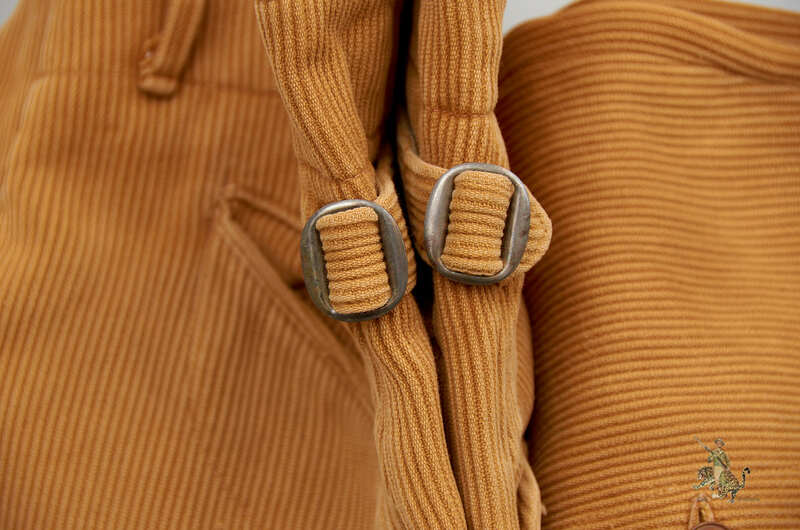 The buttons and belt hooks have a gold finish. 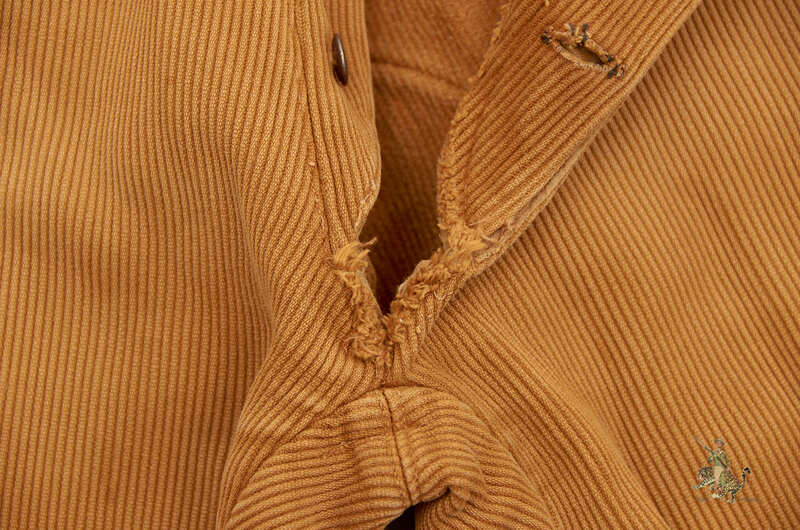 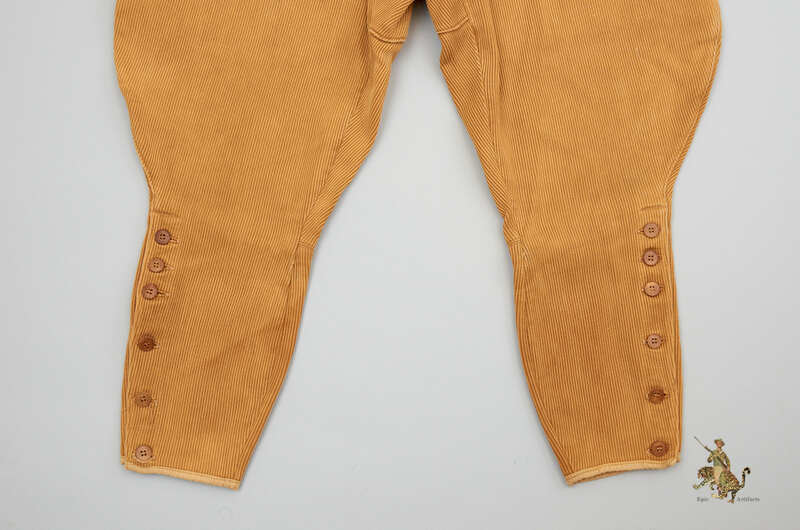 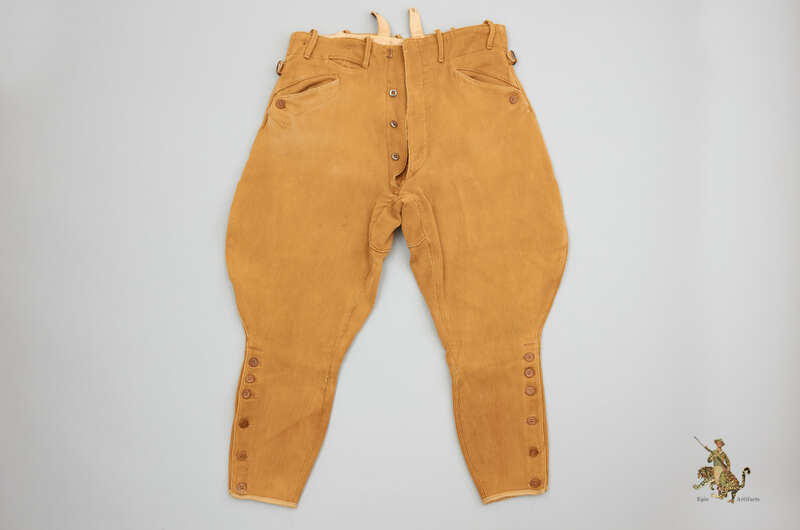 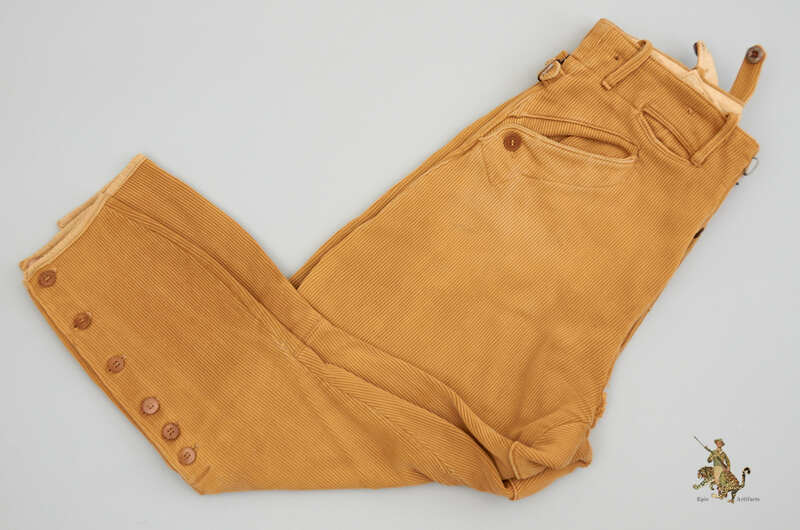 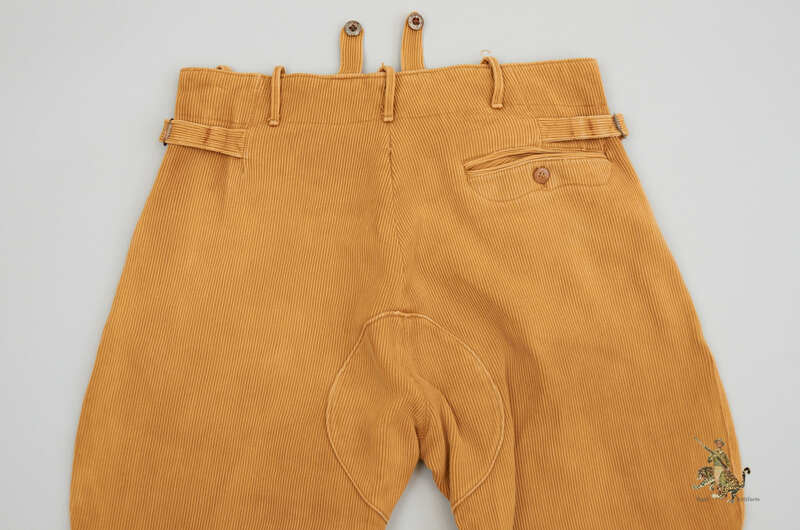 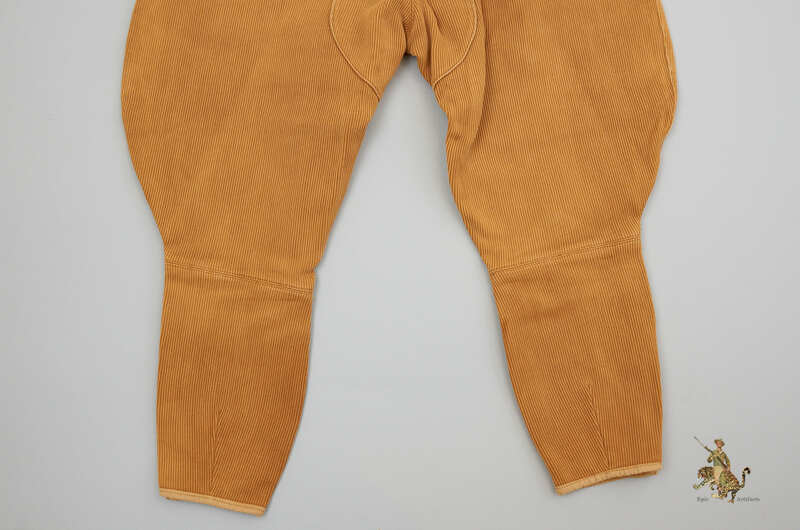 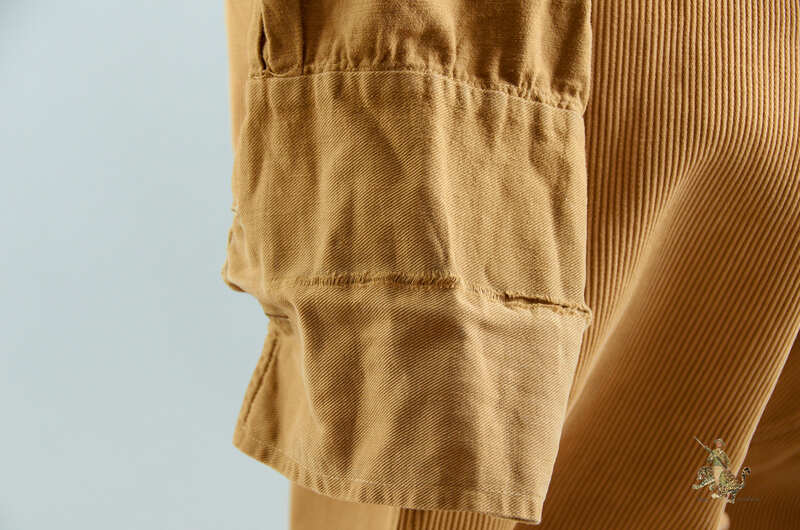 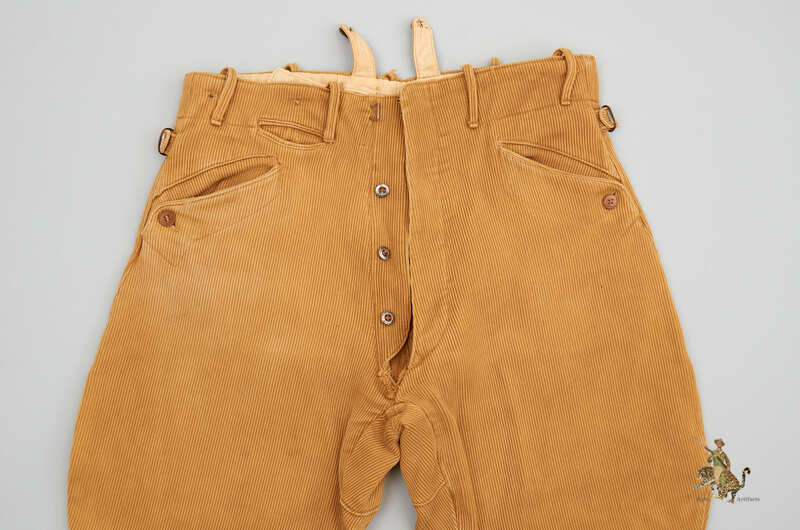 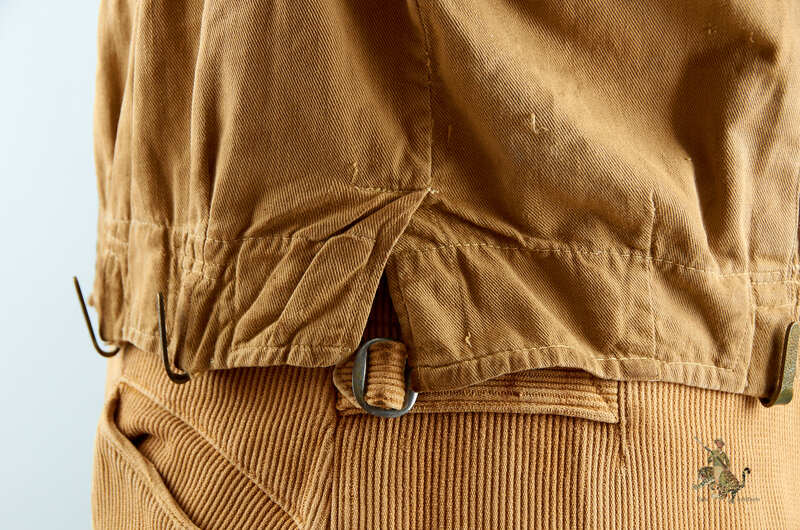 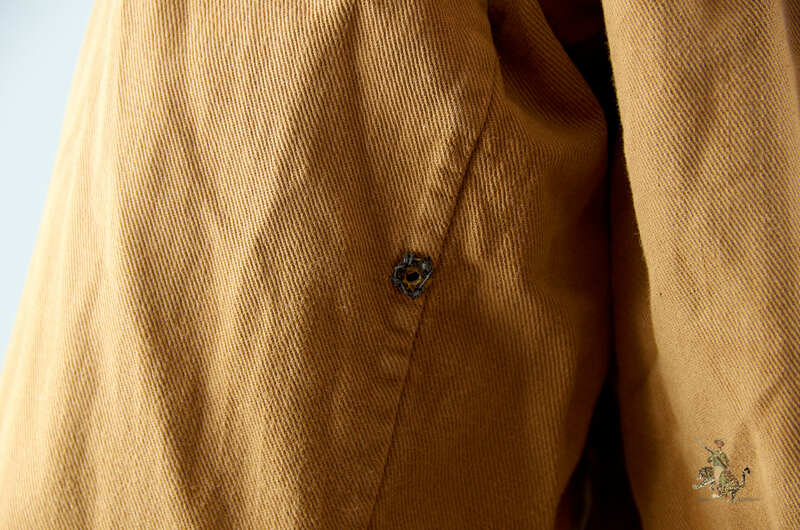 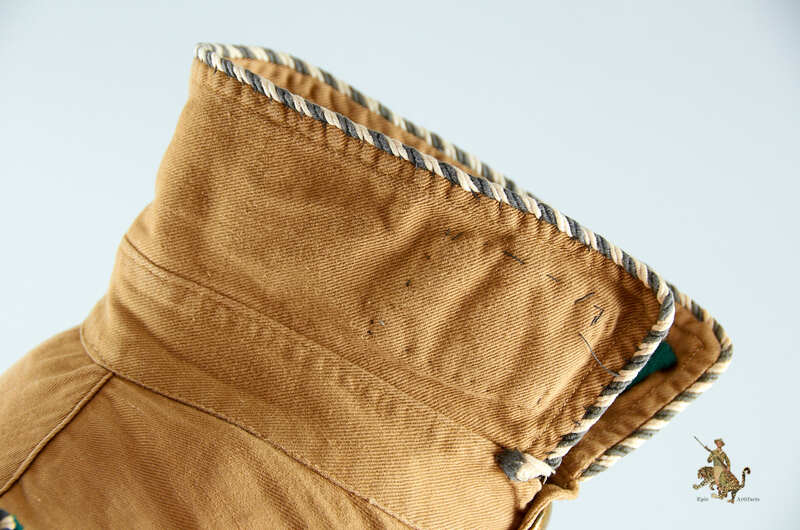 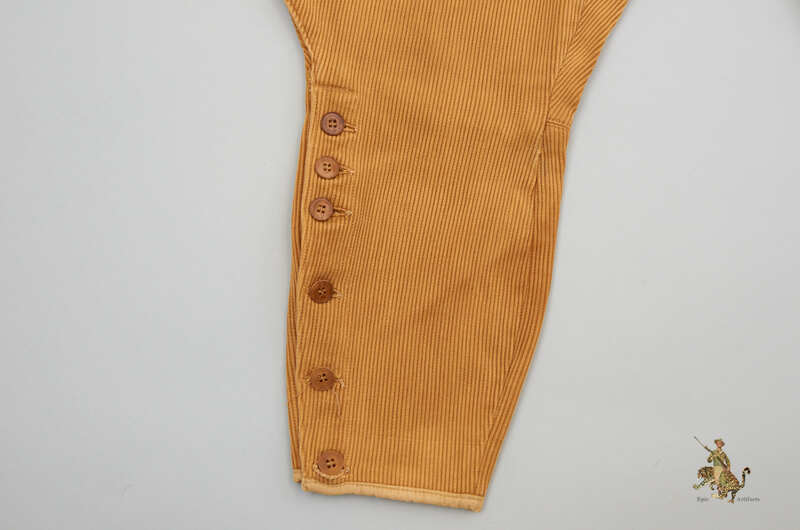 The trousers are private purchase breeches made of tan corduroy. 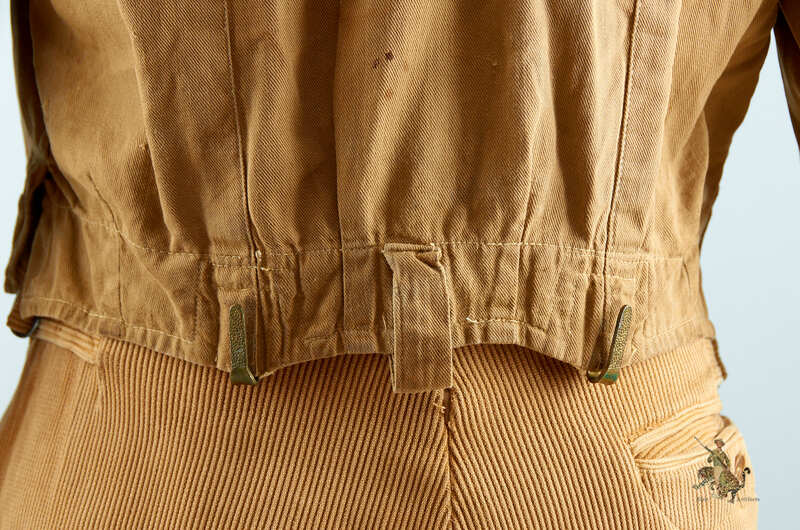 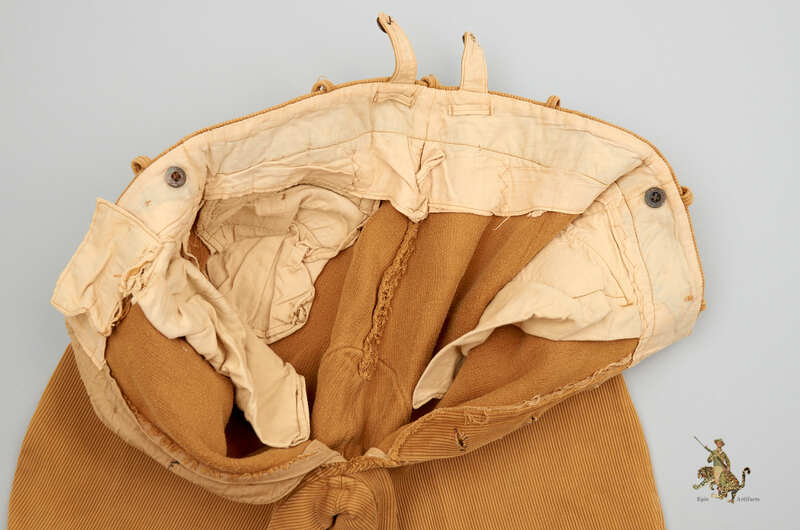 They show wear matching the tunic, with a small tear at the bottom of the crotch area, but no major damage. 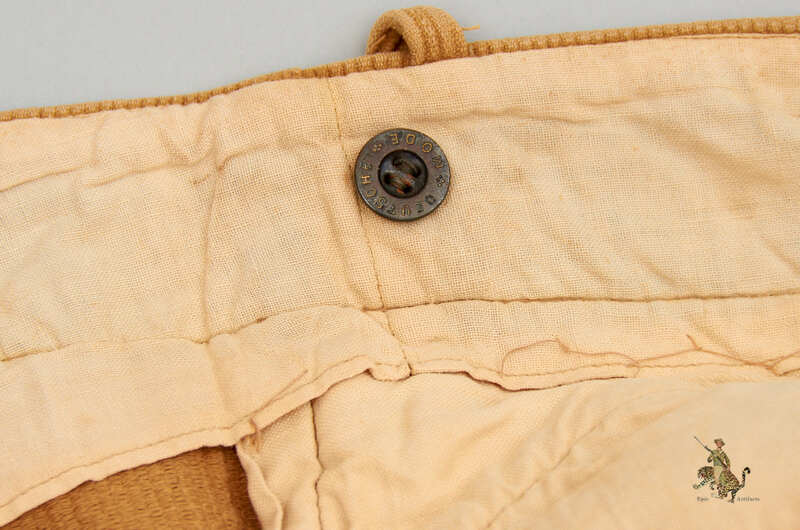 They are complete with all buttons and fasteners. 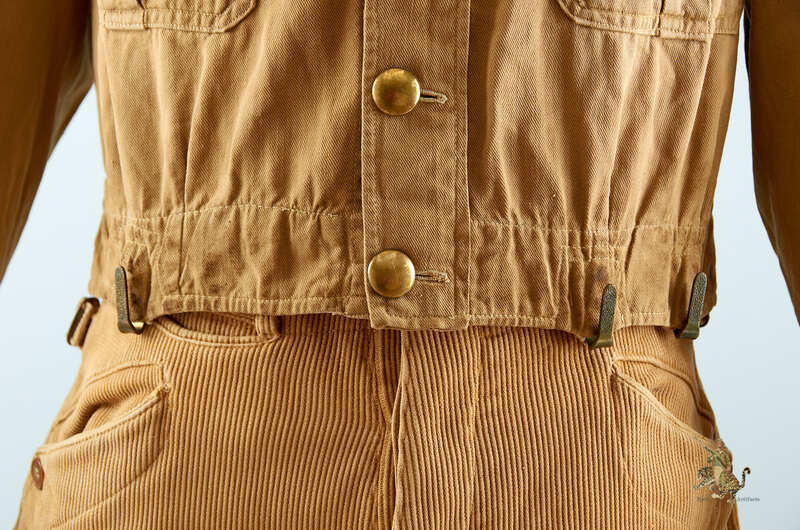 This SA tunic and trouser set makes for a very handsome display and is tough to find in this all-original configuration. 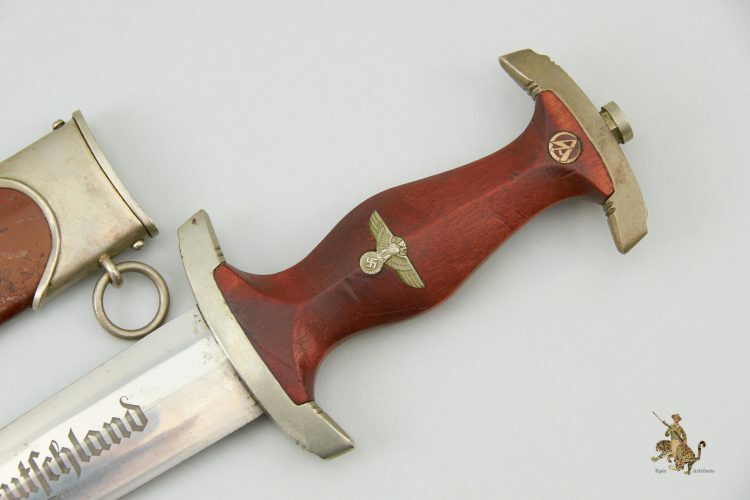 Historical Description: The Sturmabteilung, known by the initials “SA,” were the original paramilitary wing of the Nazi Party. 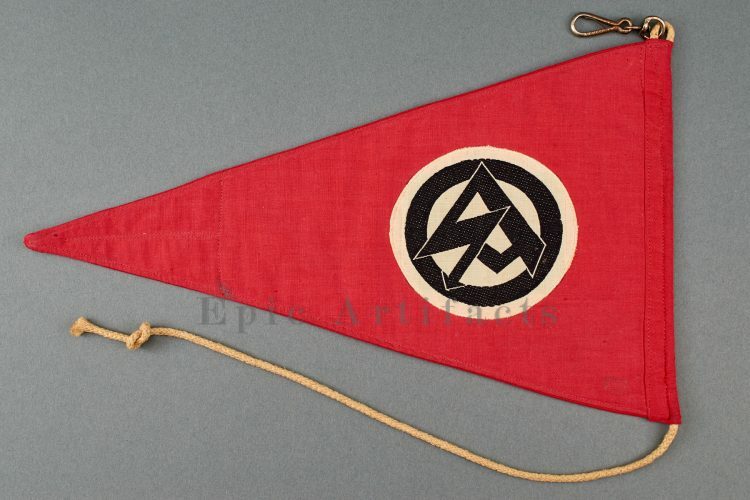 This organization was originally formed in 1921 and played a large role in the Nazi ascendancy and rise to power from the 1920s through 1933. 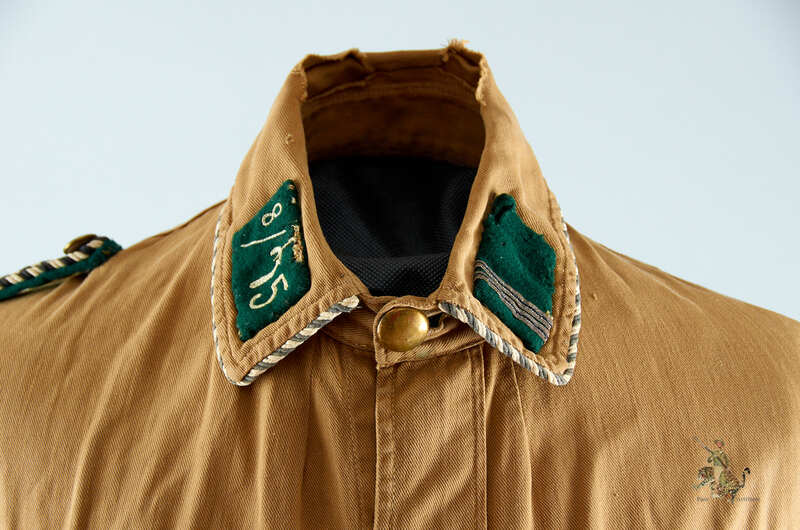 The organization had a system of ranks and was divided into units, in a manner similar to that of the military. 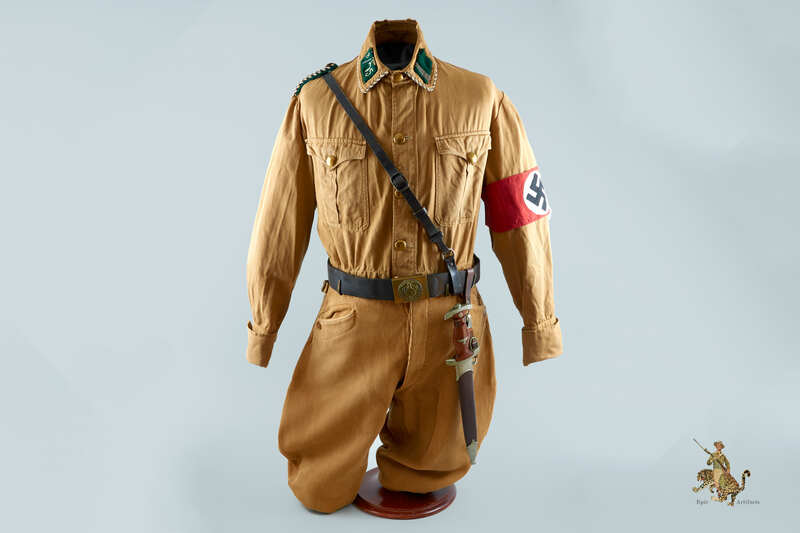 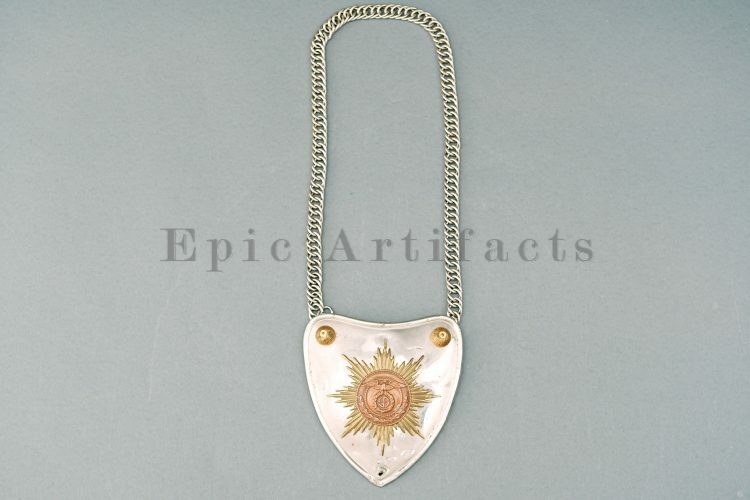 As with all of the paramilitary organizations during the Third Reich, the SA wore uniforms and had their own distinctive badges, insignia and regalia. 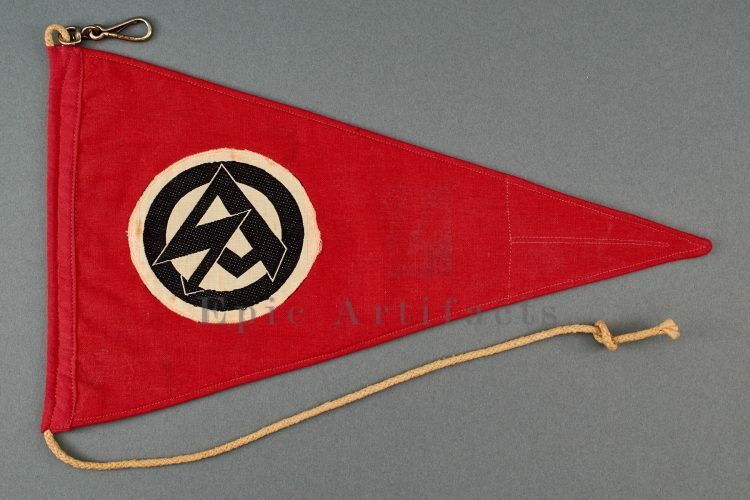 At the time of the Nazi seizure of power in 1933, the SA had two million members. 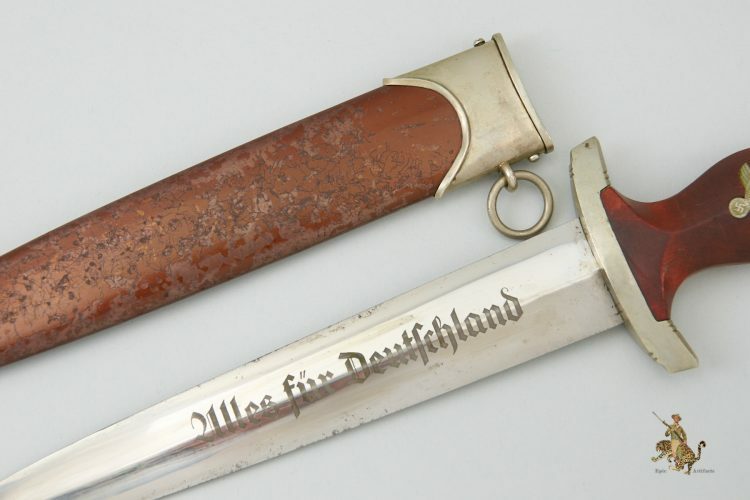 Following the Night of the Long Knives in 1934, and the arrest and eventual murder of SA leader Ernst Rohm, the size and influence of the SA decreased, but it continued to exist until the fall of Nazi Germany in May 1945. 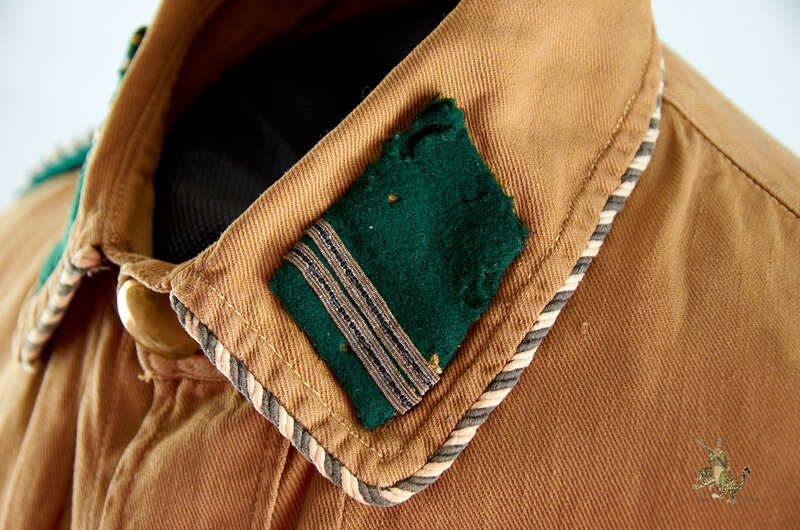 During WWII, the SA was involved with pre-military training, with the largest training unit, the SA-Marine, serving as an auxiliary to the German Navy. 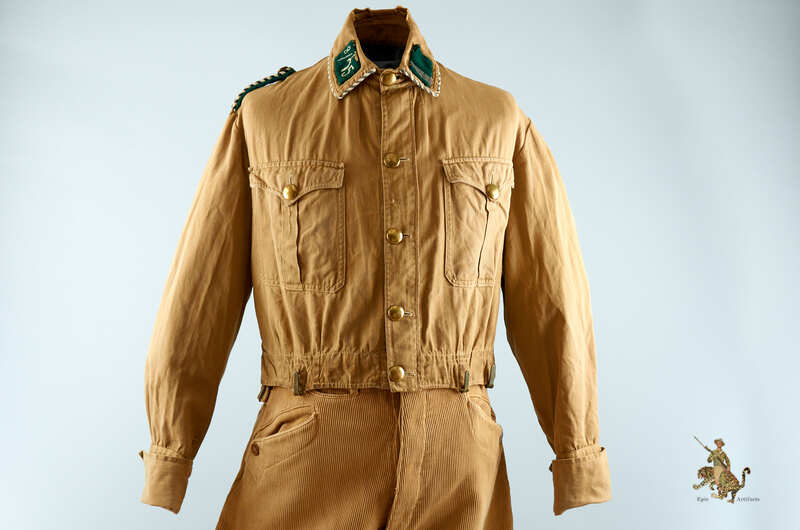 The SA even attempted to field a combat unit, at first as a Regiment, and eventually, an armored Korps- “Panzerkorps Feldherrnhalle.” The vast size of the SA at its height, and the length of time the SA was operational, created a vast range of different items of uniform, equipment, insignia, paperwork, etc., which is very collectible today.